The health and appearance of your smile is important to you. You take the time each day to brush your teeth, but are you doing enough? Although brushing is important, it is only a small piece that is needed to promote your dental health. Oral hygiene involves more than just a toothbrush. In addition to your home oral hygiene habits, you also need to see your dentist in Colorado Springs twice a year. At Anderson Family Dental, we want to ensure you are properly caring for your smile to help ensure it lasts for a lifetime. Your oral hygiene habits are your first line of defense against dental issues, like tooth decay and gum disease. All too often, people tend to believe that brushing their teeth is enough to prevent damage. However, it is only a small fraction of what it takes to maintain your oral health. Brush Twice a Day: Brush your teeth twice a day using a soft-bristled toothbrush and fluoride toothpaste. Clean all surfaces for at least two minutes each session. Do not forget to brush your tongue or the inside of your cheeks to reduce bacteria levels in your mouth. Floss Daily: Flossing cleans areas that your toothbrush cannot reach, such as in between the teeth and the gum line. Use a high-quality dental floss to clean each tooth at night before your go to bed. Eat a Balanced Diet: The foods you eat can contribute to oral health problems. Eat a well-balanced diet that is limited in sugars and starches to prevent tooth decay while building strong teeth and gums. Visit Your Dentist: Even with the best oral hygiene, you need to visit your dentist twice a year for a cleaning and checkup. Do not wait until after a problem has developed. Dentistry is about prevention, which is why your regular appointments are important. Even with the best oral hygiene habits at home, there are still places in the mouth that you cannot reach, like below the gum line. If these areas are not cleaned to remove plaque and tartar buildup, gum disease and other complications will likely occur. In addition to a cleaning, you need a complete checkup twice a year. This allows us to monitor your dental health to detect any complications while they are still small. With quick treatment, we will rehabilitate your oral health to reduce the need for costly or invasive treatments in the future. Your checkup not only includes a visual examination of the teeth and gums, but digital x-rays as well. This provides us with a deeper insight into your oral health to ensure there are no problems occurring beneath the surface. We will also check your neck, throat, and temporomandibular joint to look for protentional concerns, such as oral cancer or a TMJ disorder. Your teeth are designed to last for a lifetime with the right care. 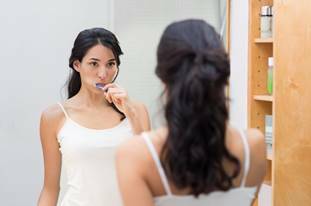 Maintain your oral hygiene routine at home and visit Anderson Family Dental twice a year for a cleaning and checkup. Contact our office today to schedule your appointment.